Physiological response of Rhesus macaques to RT exposure. (A) Radiotelemetry of core temperature of Rhesus macaques treated with huPB10 either at 4 hours or 12 hours after exposure to aerosolized RT. 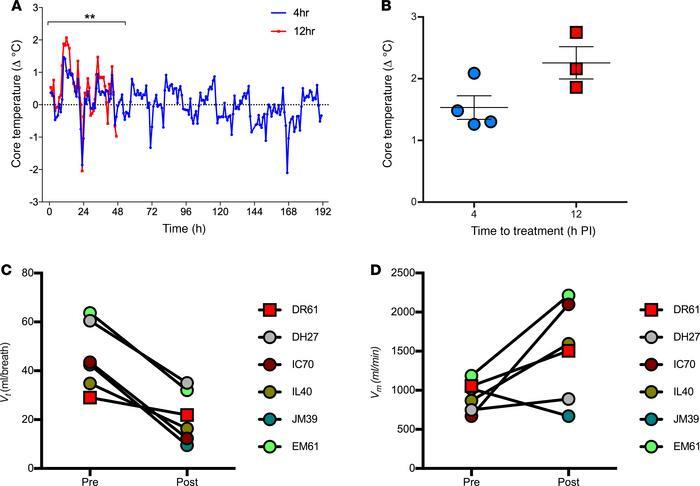 Continuous monitoring showed significant differences (P < 0.005) between the initiation and tempo of pyrexia that was dependent on the time to treat. (B) Fever intensity showed differences between the relative change (increase) based upon time to treat. Respiratory function measured by whole body plethysmography. Respiratory function was measured via head-out conductance plethysmography prior to and at timed intervals after challenge. (C) Significant changes in post-exposure group tidal volume (Vt) was observed among animals rescued from ricin intoxication (P < 0.05 by 2-way ANOVA). (D) However, compensatory changes in frequency resulted in minimal observable changes in minute volume (Vm), with some animals producing increased minute volumes +24 hours after exposure to ricin (P =0.08). Animal DR61 (square symbols) was the sole animal that survived RT exposure within the group that received huPB10 at 12 hours.